You are here: Home / Face / Is Permanent Age Reversal Possible? Is Permanent Age Reversal Possible? 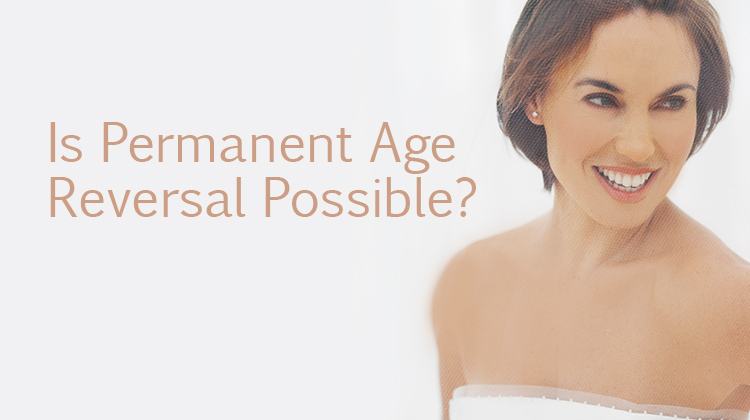 Share the post "Is Permanent Age Reversal Possible?" Physicians, skincare professionals and skincare formulators have been on a mission to reverse aging for quite some time. Most people believe that such a task is impossible and therefore our time is better spent on slowing aging. However, there is little evidence that we are even slowing the aging process using the strategies of the last thirty years. Remember the saying “you can’t keep doing the same thing and expect a different result?” We have maintained the same inflammation-induced change (temporary swelling and tightening) strategy for too long. It is time to look at the skin from a new perspective with new approaches that include human stem cell technology, real DNA repair, permanent additions to the collagen in your skin and repair of imperfections at every level. Chemical peels, heat-producing devices and daily acid applications have been tried for decades and yet we have still failed to outfox Father Time. Adding inflammation to skin that was already losing ground everyday has produced dubious results but there are even bigger risks. Most wounds do not fully recover their losses, in fact, dermal damage often only recovers 80-90% after each insult. While we can all appreciate the plumping effects of applying inflammatory ingredients, we can see that it has not made our skin healthier by any means. Your skin should instead be made healthier (exfoliation and burning make it less healthy) with a focus on strengthening immunity and repair for best results. Zinc oxide remains the gold standard for sun protection because of its broad-spectrum coverage and the minimal inflammatory effect it has on the skin once exposed to ultraviolet radiation. Every other ingredient creates too much inflammation after UV exposure. Artificial sunscreens are known to cause significant inflammation when exposed to sunlight and their use has risen concurrently with the rapid increase in skin cancer. This strongly suggests that more needs to be known before we continue using these inflammatory sunscreens. A scientific breakthrough has recently occurred in sun protection with a new oral (ingested) sun protection called UV Neutralizer Harmonized Water. It provides chemical-free, waterproof SPF 30-like protection without a topical application. The source of aging is in your dermis (the layer below your epidermis). Most skincare gets less than 5% of their ingredients into the deep epidermis/dermis because they do not have a delivery system. Liposomes increase penetration by 600% while healing the skin so look for this technology. Targeting the source also means looking inside for skin problems. Melasma, psoriasis, eczema, acne, rosacea and many other skin conditions result from internal sources. Look for companies that have figured out how to treat the internal problems like Osmosis because it is the only way to really heal the skin condition permanently. Stop daily exfoliation. Your skin has been exposed to twice as many free radicals everyday because we continue to believe that it is necessary to remove the protective epidermis. Your skin slows down because it does not have the nutrition to keep a 30-day cycle going. It is a much healthier strategy to feed the skin and restore turnover rather than adding permanent DNA damage to our skin cells. Exfoliation also exhausts antioxidant and nutrition supplies in the skin. One common theme in aging is that every year of your adult life, the circulation in the skin declines by about 1%. Since this is the primary source of skin nutrition you can imagine why the skin would slow down and heal less effectively, especially by age 40 (roughly 15% less nutrient availability). Therefore your skincare should address that problem. My favorite ingredient for that is the patent-pending liposomal niacinamide because it targets the dermis and gently dilates blood vessels. Specific human-derived growth factors also increase new blood vessel formation. Zinc Finger technology and AC-11 are the latest advances in DNA repair and the first to ever show actual, visible results n the skin like skin tag and mole removal, scar and hyperpigmentation repair, fixing broken capillaries, improvement in elasticity and wrinkles, and much more. It is the first opportunity to correct your DNA damage that has been accumulating for years and is one of the key reasons that age reversal has not been possible. This technology provides a huge leg up in our battle to overcome aging skin. Your skin is working in tandem with the rest of your body. Increasing collagen/elastin production and repairing old wounds cannot happen unless your skin is working at its highest and best. Exfoliation, AHA’a, BPO, and many other ingredients like Retin A all weaken the skin and make real age reversal impossible. Increasing the repair tools that the skin needs to rise up is not an easy task but it can be done. Our growth factors become depleted over time and so the replenishment of those using adult stem cell technology is ideal. We need to use ingredients like 1,3 beta glucan, asiaticoside and Zinc Fingers to boost immune activity. Equally as important is to stop using (most) retinols, AHA’s and (most) oxygen products every day because they suppress the immune system and add inflammation to the skin. Everything that adds inflammation will suppress the skin’s ability to repair itself and which means faster aging and no possibility of permanent age reversal. Permanent age reversal is an achievable goal. The combination of these strategies works to restore your skin’s health to the days of its youth. Once your skin is operating at its full potential, it will begin to repair old damage. It is exciting to watch the imperfections of your skin dissolve away with each passing month. Even wrinkles are, for the first time, permanently improved by this process. Remember that acids and lasers and chemical peels are all temporary fixes that last weeks to months and then revert back to the damaged state that existed prior to the treatment. That does not happen with the combination of strategies discussed above. To truly outfox Father Time, we need to trust the skin, feed it more nutrients, repair damaged DNA, replace declining growth factors, focus on the dermis (where most damage actually occurs) and stop adding inflammation.